To give you the freedom to build your ideal vacation, we are offering a selection of included and “extra” activities. Participation in activities is never required but encouraged! Your retreat time is yours. We are here to facilitate and guide your experience but be true to what you need and to what you want to get out of your down time. Designated excursion days need to be booked in advance, but all on-site activities are flexible. Yoga with Nathania – Before breakfast & before dinner Vinyasa flow yoga classes to get us moving and envigorated in the morning, and slower, more restorative practices in the evenings to wind down. Metabolic Effect Fitness classes with Gary – Learn from the co-creator of this international workout program! 30 minute rest-based workouts (work ‘til you can’t, rest ‘til you can!) designed to turn you into a fat burning machine! Appropriate for all levels. Work at your pace. Yoga & Yoga Nidra Meditation with Megan Erbe – Guest instructor Megan will lead us through Yoga Nidra Meditation sessions - or yogic sleep. These are guided body awareness meditations that help you find a deep state of relaxation. Megan will also lead some of our yoga flows. 2 Inversion & Arm Balance Workshops with Nathania - be prepared to have some fun and learn the skills you need to flip your perspective upside down! Ever dreamt of standing on your head or hands!? Here’s your chance to work on it in a safe, fun and encouraging environment. Personal Development Workshops – sessions dedicated to exploring the philosophical teachings of yoga and how they serve to help us understand and accept ourselves on a deeper level during every step of our journey. Mala bracelet making workshop – make your own mala bead bracelets- a surprisingly fun and meditative activity and a personalized way to take a keepsake of your trip home with you. Obidos Medieval Village visit – we’ll head to the village of Obidos just a few minutes from our resort and explore the architecture, history and culture of the town. Hiking in the beautiful hills surrounding the resort. Advance sign-up required by March 10th. All activities include round-trip transportation. We will be given wet suits, but plan to bring a pair of sneakers you don’t mind getting wet. Coasteering is an exhilarating rock & water activity suitable for all levels of fitness. 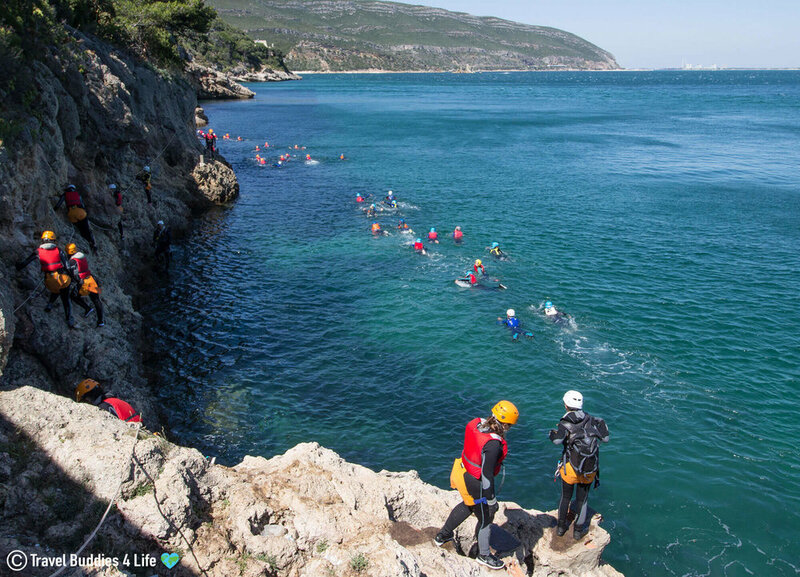 We’ll rock climb and boulder, rappel and jump off rocky cliffs into the sea below for a squealing good time. Expect big thrills and a completely different perspective on the Portuguese coastline, exploring areas that few people get to see. This activity is adrenaline-packed but administered with the highest standards of safety. We’ll be geared up in sturdy footwear (bring your own), wetsuits, buoyancy devices and helmets. There are opportunities to opt out of certain parts (ie: you don’t have to cliff jump if you don’t want to). The traditional wine estate of Quinta do Sanguinhal is just outside the small town of Bombarral and has been in the same family since 1874. 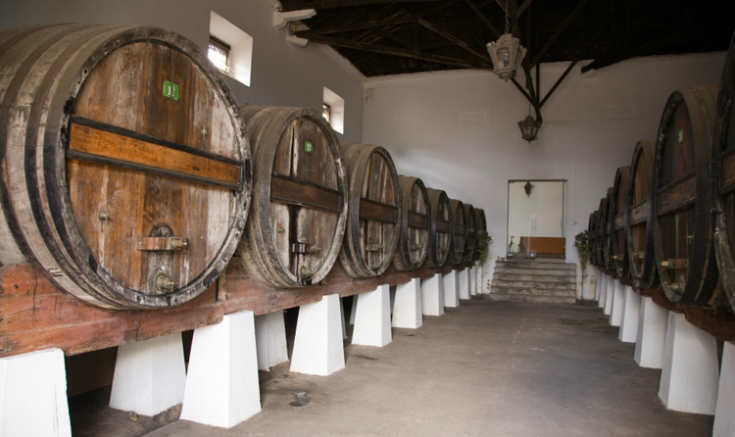 It has the distinction of having an onsite distillery, which was used to produce brandy for drinking and making a fortified wine that resembles port wine. Tasting of 7 wines (2 whites, 1 rosé, 3 reds, 1 fortified wine), with crackers, regional cheese and mini pastel de nata (custard tarts). 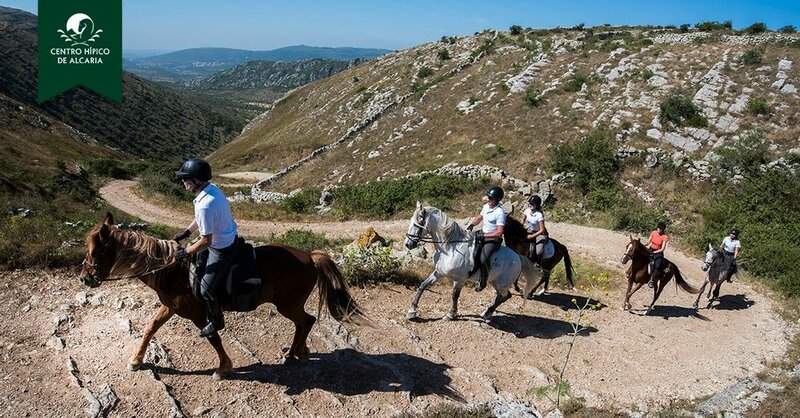 Saddle up and ride horses through the beautiful backcountry of Portugal! Walk, trot and canter through old villages, explore vineyards and expansive mountainous scenery. Connect with nature and these beautiful animals on this 2 hour tour. Depending on the experience level of who signs up, we may be broken up into 2 riding groups. Wanna do them all? Click here to sign up for all 3! There is also the option to go surfing and to enjoy a beach day about 20 minutes away from the resort. You will be able to arrange this on your own or as a small group once we are on site. If enough of us are up for one or the other or both, we’ll make it a group outing!